The University aims at producing such IT professionals who leave the impression of excellence in knowledge and skills in their professional lives. Students are encouraged to come up with innovative and unexplored ideas while addressing a problem. At first it is important to understand what the software is? “Software” can be defined comprehensively as, “Computer Programs that, when executed provide desired function and performance, data structures that enable the programs to adequately manipulate information and documents that describe the operation and use of programs”. Looking at the definition indicates clearly that developing software does not mean mere development of programs (or code) rather it requires the related documents to be produced as well. To develop software effectively requires following a process. Each stage of this process culminates in one or more artifacts. Examples of software projects are, software developed for face recognition, building a Customer Relationship Management (CRM) System, Flight Simulation System, Point of Sale (PoS) System, a Web Portal, an Electronic Store Front etc. Software projects can be aimed at producing a desktop application, an embedded application (like to be used in microwave oven) or some online application. The University aims at producing such IT professionals who leave the impression of excellence in knowledge and skills in their professional lives. Students are encouraged to come up with innovative and unexplored ideas while addressing a problem. After having completed the project students will be expected to have the following skills, It will provide the students with an opportunity to implement the concepts they have learned throughout their degree program so far. Awareness of the latest technologies being used in the industry and more importantly the application of those technologies. Knowledge of all the formalities required to undertake a software project. Enough confidence to take the challenges of their practical environment. Should I take Software Project? The development project is recommended for those students who have an aptitude and interest (equally important) for development. Presence of analytical skills to solve a problem is also highly requisite. If a student finds these ingredients in himself/herself then deficiencies (to a certain extent) in the areas like programming, data base and software engineering etc can be overcome but such a student will have to put extra efforts (depending upon the deficiencies) to make his/her weak areas stronger. As having ambitions only does not lead to the goal, one has to strive for those ambitions to get them materialized. No student below 1.75 Effective CGPA will be allowed to take the project title. MCS/MIT Students must have completed 30 credit hours to become eligible for taking the final project. So don’t enroll in CS619 course or drop your cs619 course if you have earned less than 30 credit hours. BSCS/BSIT Students must have completed 90 credit hours to become eligible for taking the final project. So don’t enroll in CS619 course or drop your cs619 course if you earned less than 90 credit hours. Students will be clearly communicated about the deliverables they need to submit on specified dates. 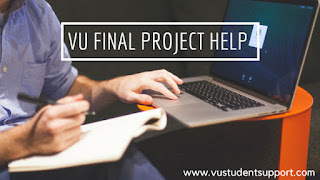 This is important to remember that each deliverable carries a significant weightage so students are advised to take each deliverable very seriously and submit it according to the date announcements according to the submission schedule. Effective use of time and of visual aids. Seriousness and dedication of the students in meeting the announced dates for each deliverable.